SampleRack is the open-ended percussion module for the modern player. In a streamlined single rack-space module, SampleRack delivers hundreds of professionally recorded in-demand sounds—and you can easily add more. And accessing the sounds couldn’t be easier.SampleRack offers an expansive array of trigger inputs, plus full compatibility with all MIDI equipped pads, triggers, sequencers, and instruments. The backlit LCD panel and minimal controls combine to deliver an uncluttered appearance and intuitive access to all parameters. 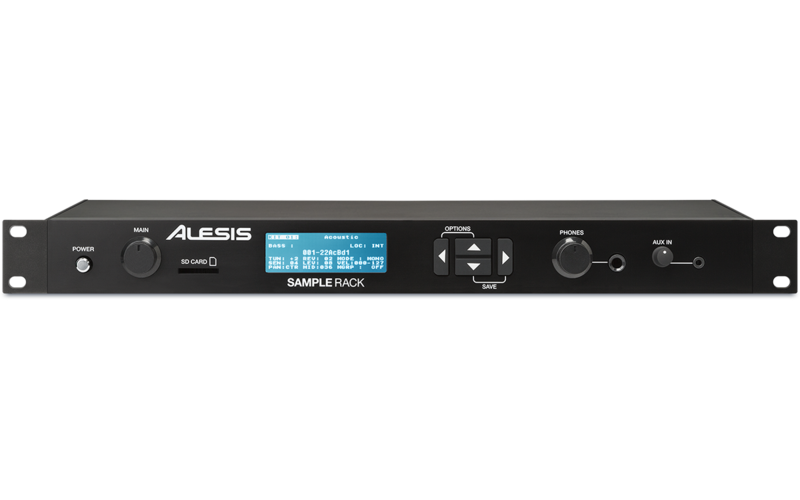 So whether you are looking to add a newpercussion sound source to your studio, enhance your live rig, or upgrade the “brains” of your current digital drumset, SampleRack is your one-stop solution. With SampleRack, there’s no limit to your sonic creativity. Built-in are over 200 carefully-crafted drum, cymbal, andpercussion sounds—each created by the professional Alesis sound design team. Sounds are arranged into ten preset drum kits for instant access during performance. Plus, each sound offers individual access to key parameters such as pitch, panning, and reverb for customized control. And when that next “must-have” sound comes around, you can even use an SD card (up to 32GB, not included) to store an additional 512 sounds and 20 custom kits. For the performing pad player, SampleRack is equipped with eight dual-zone 1/4" trigger inputs. In addition, there are specialized Kick Drum and Hi-Hat pedal inputs. The Kick Drum pedal jack provides both switch and trigger options; the Hi-Hat pedal jack can be set for either switch or variable operation. All of the internal sounds can be accessed via MIDI for maximum versatility. Equipped with a standard USB port, SampleRack offers convenient single-cable connectivity with your computer. 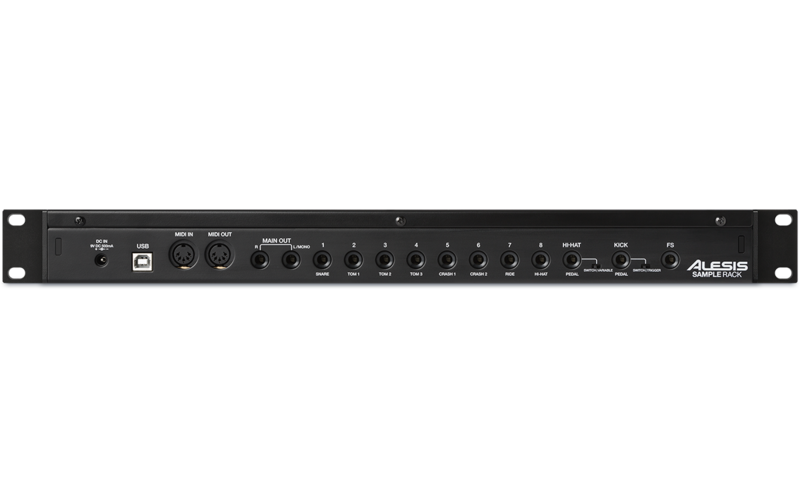 Standard 1/4" outputs provide a direct connection to an amplifier, sound system, audio interface, or recording setup. 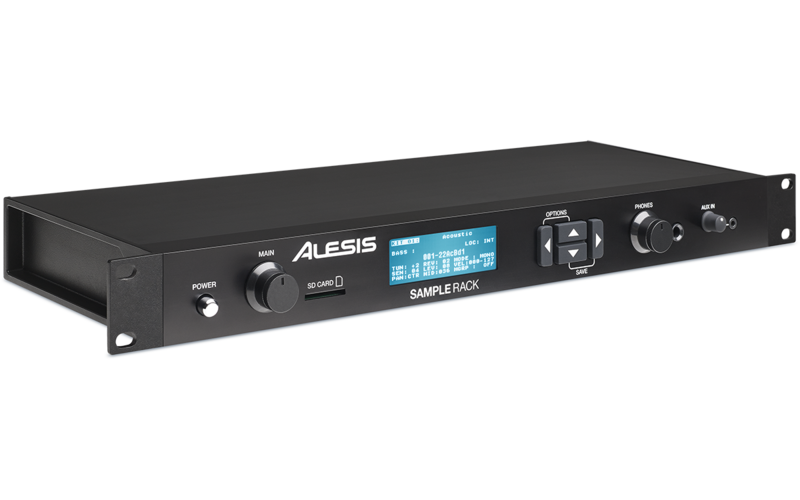 The headphone output allows for hours of uninterrupted private practice, or for isolated on-stage monitoring, and even features a dedicated volume control. As an added bonus, SampleRack includes a stereo aux input—with level control—so you can play along to your smartphone or MP3 player, rehearse the set list, or jam to your favorite tunes.